Hi folks! This is my first post on TJJJ. I usually blog at Dirty White Belt, and this is cross-posted over there. I'm excited to do some writing over here, and I deeply thank my friend the (formerly) Grumpy Grappler for the opportunity. Onward! A new guard comes out every week. It's remarkable how, after billions of years of evolution and thousands of years of human grappling, completely unforeseen positions somehow crop up every time there are DVDs to be sold. It’s also interesting how, when a new guard is “created,” we’re treated to marketing efforts that inform us how innovative it is, how cutting edge, how devastatingly effective. Hyperbole has its value, of course, as the Raymond Chandler quotation from above emphasizes. You’ve got to believe in what you do, and you have to market your instructional. Also, believe you me, I’m going to engage in a little hyperbole, right now. Here is is: There is no such thing as spider guard. Or worm guard. 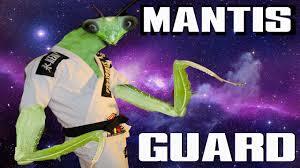 Or koala guard, or God help me mantis guard. There is no such thing as any of these. There is only the guard. And the guard has principles. Every good and useful position within guard adheres to these principles. Many times, fancy terminology for allegedly innovative positions disguises the fact that these “new" guards have been played for years — or worse, it distracts us from one fundamental concept of good guard play. Now, obviously I don’t mean “the positions typically described as spider guard positions do not exist.” That’s where my own hyperbole comes in. I want you to consider the idea “there is no such thing as [insert name of guard position]” in terms of a thought experiment. The positions exist. But when discussing the guard with new students, it’s more helpful to explain to them the concepts of what a good guard means rather than tell them "go straight to this specific guard position that you must use.” When we describe these positions, we should see this terminology as helpful visual shorthand and nothing more. First, I’ll talk about why the last paragraph I wrote is true. Next, I’ll focus on why understanding the fundamental principles of guard is important. And finally, I’ll talk about what this idea means for those of us who train.